I just received images from New Zealand of Tika Whare. Their winter collaborated in wonderful ways with the structure and it reminds me of a carcass in the fields. As if the home was once alive. My home away from home, James, Sue, Cam and Ben were night sky navigators of the southern hemisphere the first evening I arrived. They assisted and planned and explained and fed. During our time together the evening table was always filled with delicious food from their farm, but more importantly most days and nights family and guests graced the table with conversation, cultural comparisons and games. The all important questions from the boys Ben and Cam sparked new ideas, and the everpresent grace of James and Sue reformed the concept of home for me. Always ready to help with process or fastening a corner, the Truebridge family are my collaborators. My most heartfelt thanks. Tika Whare (pronounced Tika Phorae) in Maori means true home. If there is one thing I have found here in New Zealand is that your home is anywhere that you need it, it is always with you. Everyday out in the paddocks I have been visited by friends and extended family even though we are very isolated here. Today John, a neighboring farmer, brought over some beautiful fleece to be used in the installation. Yesterday, the extraordinary Caroline Robinson (New Zealand artist) visited with her daughter and while sheep grazed nearby we listened to her tell the children’s story of the felted house. The roof is almost done and we will be raising it tomorrow. 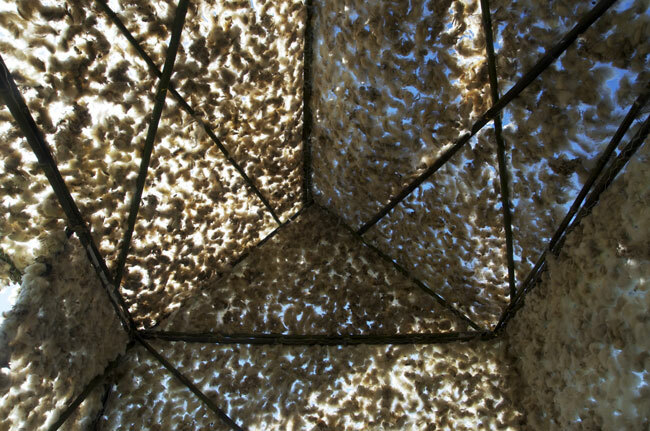 The netting sings to me as the wind blows through it, and the wool moves like a breathing animal. This home is alive. One of the wonderful things about traveling to another country and setting up an installation with none of your studio tools is the challenge to stretch your mind around unfamiliar materials. Bamboo, flax, and silage netting, all found on Te Hapua farm, are being used in place of my familiar lumber, stakes, chicken wire and nails. Here is the wool bale they set aside for me. The form I have chosen is a little woolen home that sits up on an exposed knoll overlooking the magnificent Lake Taupo and with views of the surrounding volcanoes. The sky is big here, and the land vast. Ah, New Zealand. It is a hardy land. I am on north island in the Lake Taupo region on a large sheep and cattle farm called Te Hapua, and staying with the wonderful Truebridge family. The place where I rest my head is a campervan and my studio is the wool shed and paddocks. 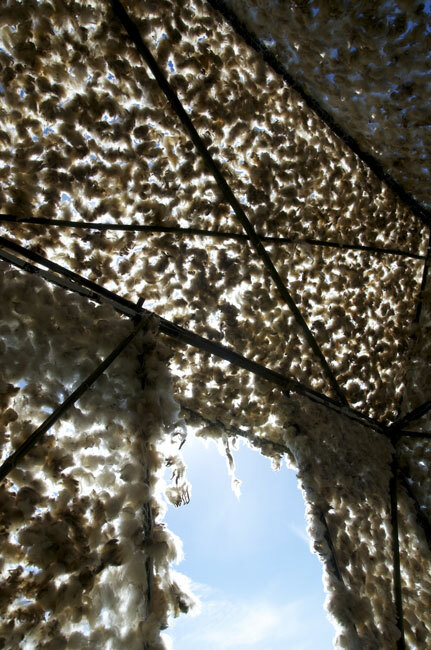 I am in heaven using the materials I find on the farm to create an installation of wool. But it is much more than that. It is watching the dogs rustle up the sheep from the hill paddocks in the early morning, witnessing the slaughter of our Easter lamb, or enjoying the dinner conversation of sharing the differences and similarities of our countries and lifestyles. My first few days here have been about shaking hands with the environment and sussing out materials and design. 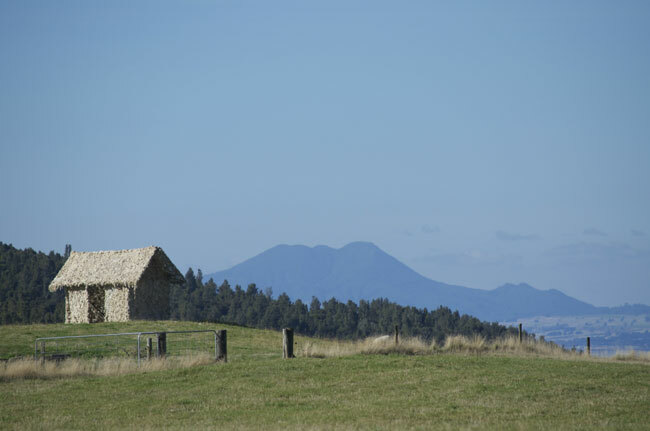 At the end of March I will be heading to North Island, New Zealand, for a self designed four week residency on a beautiful (7,000) sheep farm in the region of Lake Taupo. It is timed so they will be sheared while I am there. The landscape is breathtaking and the possibilities are endless!